Yesterday Mom put Luke in an ExerSaucer for the first time. 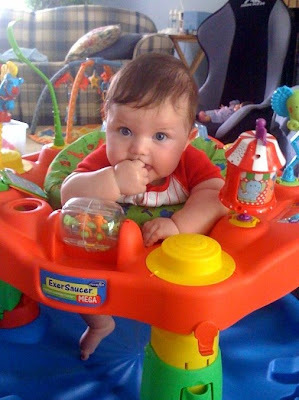 An ExerSaucer is kind of jumper toy that helps kids development leg muscles. Even better than developing leg muscles is that it allows Luke the ability to look around without having to be on his back or tummy. Judging by the below video I think Luke enjoyed it too.